George Osborne, the chancellor, expressed shock: “I was shocked to see that some of the very wealthiest people in the country have organised their tax affairs, and to be fair it’s within the tax laws". Just as you don't have to prove the £10 note in your pocket actually belongs to you when you spend it, you don't have to prove the bearer security belongs to you - just having it is proof enough. The London Metal Exchange, highly regarded for its discipline and probity, runs its trading activities using bearer warrants. How else could several tonnes of copper be delivered by a man on a bicycle. 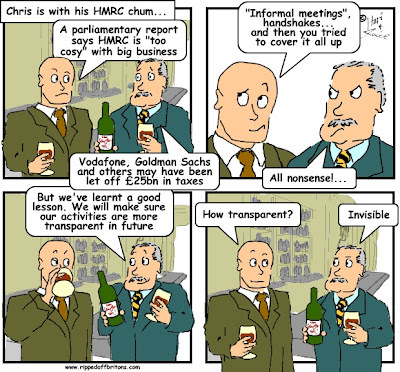 Britain (unlike most offshore locations) does not regulate company-formation agents. It even lets firms be founded with bearer shares, which, like cash, belong to whoever happens to have them with him at the time. Most countries have abolished these securities, under pressure from international financial regulators, but one British website offers same-day incorporation of a UK bearer-owned shell for a mere £142 ($227), within four to six hours. (1)A company limited by shares may, if so authorised by its articles, issue with respect to any fully paid shares a warrant (a “share warrant”) stating that the bearer of the warrant is entitled to the shares specified in it. (2)A share warrant issued under the company's common seal or (in the case of a company registered in Scotland) subscribed in accordance with the Requirements of Writing (Scotland) Act 1995 (c. 7) entitles the bearer to the shares specified in it and the shares may be transferred by delivery of the warrant. (3)A company that issues a share warrant may, if so authorised by its articles, provide (by coupons or otherwise) for the payment of the future dividends on the shares included in the warrant. This is just one of the many hidey-holes available for those with a need to proffer their finances for inspection - either to the tax authorities, or to the voters. Hidey-holes that the author of HMRC's report on the General Anti-Avoidance Rule (GAAR) says "Such tax planning is an entirely appropriate response to the complexities of a tax system such as the UK’s." Hand the 'bearer shares' to your accountant (they now belong to him), sign the declaration that you have no conflicting commercial interests, then take the shares back (they now belong to you). Like Eeyore, Winnie the Pooh's asinine companion, putting the burst balloon into the honeypot, "he takes it out again, and puts it in again, and takes it out again, and puts it in again." The ownership of bearer shares are untraceable by anyone, from the tax man to your ex-spouse's lawyer. Richard Murphy, noted tax expert and director of the Tax Justice Network provides further information in his guest blog: click **here**. The rants of chancellors a couple of Gordon Brown,s for the Goldfish :) Labour Conference 1996 " A Labour Chancellor will not permit, tax relief to millionaires in tax havens" and Brown again 15/11/98 " We are taking action on tax avoidance ,for 18 years they ( the Blue Tories not his Red Tories ) failed to do so" they were,nt the only ones were they ? liblabcons are nothing more than extensions of each other !